Dragon’s Dogma is an RPG game set for release by the Japanese company, Capcom, next week and I for one am looking forward to the adventure that awaits me. Fortunately the demo was recently released and I could get a taste of what was to come. The game appears surprisingly American even though it is Japanese-made and reminds me a little of The Elder Scrolls. 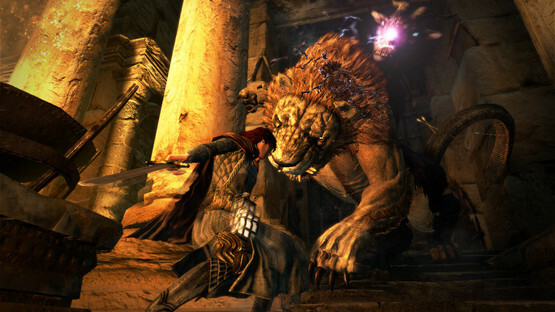 Dragon’s Dogma is set in a huge open world and at first looks to be rather plain, but do not be deceived. The game is very interactive and you can basically do anything you can think of, including climbing onto enemies which is AWESOME! I actually grabbed onto a griffin that was trying to fly away and stabbed it! I also liked how you can use rift stones to summon other characters known as “pawns” to assist you in your battles, they are surprisingly smart too and will even climb onto enemies too, a real asset in combat. The pawns do tend to be rather noisy during combat though as they yell out all kinds of instructions and advice which can be a little hard to follow when you’re trying to kill a monster or five. I didn’t really seem to need most of the advice so ignoring it seemed to work out pretty well. Fighting the boss was FUN, a huge creature made up of a lion, a goat and a snake jumps out and promptly gobbles up one of the men in your party (that really made me laugh out loud) and then focuses his attention on the rest of the crew. There’s not much that is unusual about combating this boss except that different animal parts are more susceptible to certain attacks than others. For the lion magick appears to be its weakness and for the goat melee attacks are they way to go. As for the snake, according to your pawns, it is the part of the creature that you should kill first. The battle isn’t particularly difficult but it is long and hard enough to be fun and being able to jump onto the critters back and attack certainly adds to the excitement. I got quite a feeling of satisfaction when the monster finally fell over and died. The Dragon’s Dogma demo definitely piqued my interest and I went and did a little further research as well as watched a few trailers and it honestly looks like the completed product is going to provide a lot of enjoyment and more than a few new activities. If there are any gripes then it would be the rather standard graphics and the black bars on the top and bottom of the screen, there also seemed to be a lot of screen tearing which was annoying at times but these may just be in the demo, I certainly hope so. Will I get the game based on the demo? Yes. I went ahead and pre-ordered it but then, as I said, I do enjoy RPGs. Players that are not fans of the genre should still enjoy the game and I would recommend at least trying the demo, you might be in for a pleasant surprise.